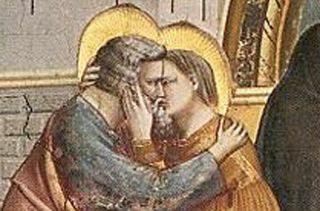 Feast of St. Joachim and St. Ann! Grandparents to Baby Jesus! Remember your grandparents on the Feast of St. Joachim and St. Anne! 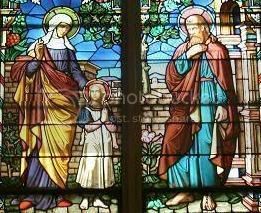 St. Anne is the patroness of old clothes dealers, seamstresses, laceworkes, housekeepers, carpenters, turners, cabinetmakers, stablemen, and broommakers, and she is invoked against poverty and to find lost objects. Although the martyrology doesn't say so, she must be the patronness of Grandmothers, and we love her for that because she we could never get along without our grandmothers. The children love to recall that if she was still there when the Christ Child learned to talk, He called her Grandmother. The nicest of her symbols we think is a cradle with the infant Virgin Mary in it. From the Saint of the Day! We think the best way to honor the feast of St. Joachim and St. Anne is to do something lovely for grandparents. Little girls might dress their best dolls as the tiny Mary this day and lay them in flower bedecked cradles. Under Her Starry Mantle has done a wonderful job of preparing for the feast day. My St. Anne links on del.icio.us. We included grandma in our St. Anne feast days in the past. Last year we entombed her ashes as close to the feast day as we could. This year we will take some flowers to the cemetery and a green ribbon. I also plan to make some red and green cupcakes today. Scenes from past year's Feast of St. Anne with my mother.